ST. GEORGE — A young boy was sent to the hospital Sunday evening after he was hit by a minivan whose driver did not have time to react when the child ran into the roadway without looking for traffic, police said. 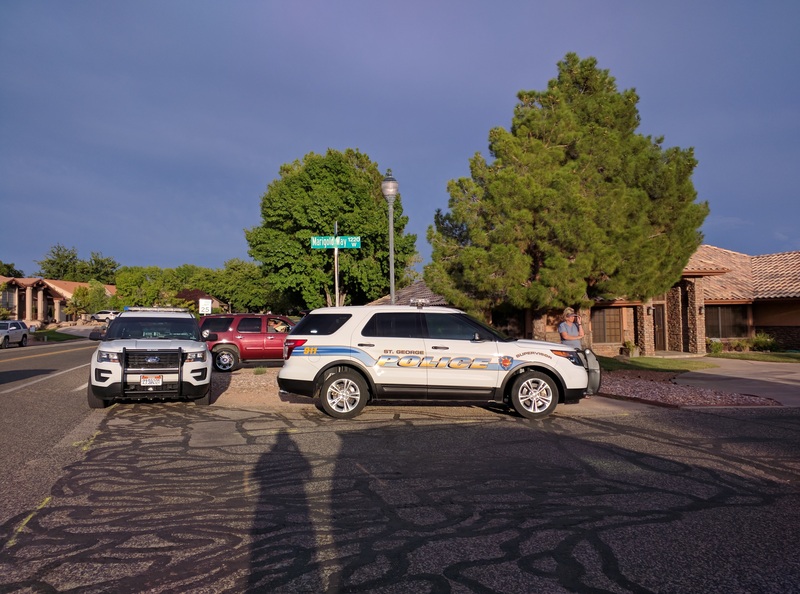 St. George Police were dispatched to the incident shortly after 7 p.m. at the intersection of West Bloomington Drive and Marigold Way. Police arrived to find the injured 7-year-old boy being tended to by bystanders and medical personnel from Gold Cross Ambulance and St. George Fire Department, St. George Police Sgt. Spencer Holmes said. “He had a laceration to his head and was scraped up and kind of shaken up from the incident,” Holmes said of the boy. According to police estimates, the man driving the minivan was going between 10 and 15 mph and slammed on his brakes when he noticed the boy but still hit the child. The driver immediately stopped and got out to help the boy. The boy was alert and talking following the collision, and he was able to get up and run out of the street after being hit. His mother transported him to the hospital for further treatment. “We did not see that the driver of the minivan was at fault in the accident, thus a citation was not issued to him,” Holmes said. “The 7-year-old boy from our investigation looks like he is at fault for the accident. Thank you,driver, for not being one of the many who speed on that road! Whew! Police arrive at the scene of an auto vs child after medics and ambulance were already there. Never heard of such a thing. Like an explanation from SGPD why a patrol unit is last on scene to a auto vs child T/C. I can answer that for you. Police have to generally concentrate patrols that statistically have the highest concentration of crime; (St.George metro area, Dixie Downs, and Washington City.) and therefore the 911 calls that follow. I have lived in Bloomington, Bloomington Hills, and now Sun River over the last 30 years, do to a practically non-existent, zero crime factor they have no reason to be here, or patrol here; at least not until the criminals discover that this is where the money is, and at least 50% of the homes here; are in fact, second homes of the owners; therefore, at any given time (but especially when it’s too hot, too cold, or holidays) there are many, many unoccupied homes (and they are unoccupied for weeks) with untold booty inside. “Ignorance is bliss” or so they say. P.S. I would be interested to know if the “School Cop” was 200ft away at the high school at the time? Glad to know the driver was not held responsible. Far too often pedestrians are at fault and the driver is charged. Baloney Dessert Girl. Keep it real. I live across from an elementary school and 1 in 5 drivers do not slow down to 20mph when driving through a blinking red light school zone. 1 in 5 do not stop at all for stop signs. Add to that 1 in 3 drivers are on cell phones. THE PROBLEM IS NOT PEDESTRIANS. Look in the mirror. Dessert Girl If you drive around with your smart phone in your ear – you are the issue, and If a random little kid goes out into the street will you be on your cellphone, and react in time? The driver involved in this accident deserves thanks from this community. You deserve to be rebuffed. Ha ha, your comment was so witty. Silly girl. You’re quite the statistician. I wonder what percentage of pedestrian involved accidents the pedestrian is the PCF. Some folks will refuse to see the reality of what I’m going to say here, and think I’m a very cold hearted person. Nothing could be further from the truth. I believe this accident may well be a blessing! This child will likely never enter a street again, without looking first. And hopefully, he will pass the message, at least to his friends. Where were the parents and why was that child not supervised? 7 is too young to be crossing that street alone. Sapphire, from your lips to the parents ears! In my neighborhood, the parents let their kids ride motorized scooters down the middle of the street with no helmet! I talking about cute little 6-8 year olds girls! I often wondered where the parents of those kids were, until one fine day I saw mommy following behind on a bicycle – also no helmet! Great example, Mom! In this instance, my heart goes out to the driver of the mini-van and his family, I’m sure it was as traumatic for them as it was for the 7 year-old! Where in this story does it say the driver was speeding? How do you jump to speed bumps? Why don’t you get your exercise at the gym instead of jumping to false conclusions. Where we live the kids run out into the streets without looking on a daily basis’ and the drivers speed too!!! Oh yeah there’s a school not even 2 blocks always but you wouldn’t know that cuz there are absolutely no signs anywhere to tell you a school is near!!! Not one sign in any direction and the parents are the worst drivers of all!!! Speeding to get their kids to school on time, speeding so they won’t be late for work, speeding to pick up their kids so they can get the best spot, or cuz their late!!! Running stop signs cuz they are in such a hurry to get back to their shows or their other Kids they left at home for 5 mins so they dont have to bother with putting them in the car!!! And if they do they do not put their small children in the proper restraints, and they hang out the windows while the parents are running stops signs and speeding not paying attention to the other kids walking home that might run out in front of their car, and or having to cross the street in a crosswalk that doesn’t have crossing guards!!! But hey its always one or the others fault!!! To me no 7 yr old should be out running around without a parent supervising them in the first place!!! So thank you to the driver that was actually going under the speed limit and was paying attention to his surroundings!!! Hats off to you sir!!! Kids are dumb and sometimes run out into traffic. Some of them don’t survive. Nothing eventful happened with this, and yet you ppl are whining as if you were stabbed in the face with a fork. I don’t get it.